The other day I decided to have some fun by running book titles through the Bad Translator engine. I found it funny, tweeted it, and went about my day. Imagine my surprise several hours later when I went back to Twitter and found close to an hundred notifications. How did this happen? How did this little tweet gain such traction? 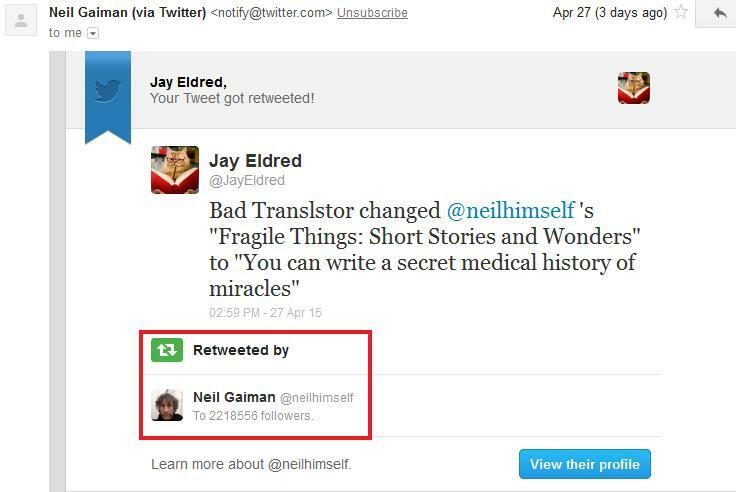 That’s right; Neil Gaiman – the author himself – retweeted me! This means that I have now been retweeted by both Neil Gaiman and Amanda Palmer. To me, that’s epic. This Basis may not be According to Plan, but there is a Way, as You Know, of Fear. What about you? What titles can you mangle? The past few days have been . . . not normal. I’ll post about that a bit later on. 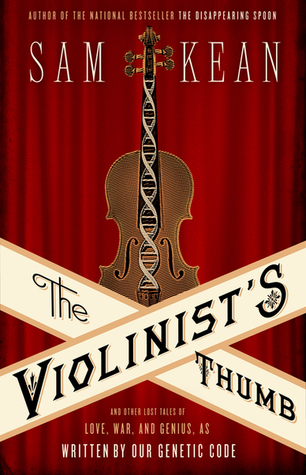 This week I’m reading The Violinist’s Thumb by Sam Kean (the same Kean who wrote The Disappearing Spoon). Come, Sad Puppies, and sit around the fire. Perhaps this is the very fire by which Mary Shelley created Frankenstein. Or not. It’s just a fire, and I don’t write Science Fiction/Fantasy. Deal with it. It’s New York City in the 1970s, and Joey Zasa has taken control of the Corleone crime syndicate. In another age, Zasa may have been the most powerful crime boss to ever rule a family; however, he comes to power at a time when crime families desire more legitimacy and overall public opinion is turning against the gangster lifestyle. A smart businessman, Zasa nonetheless earns Michael Corleone’s displeasure by dealing narcotics and living a flamboyant, high-profile lifestyle – both of which draw unwanted attention to the family’s criminal activities. 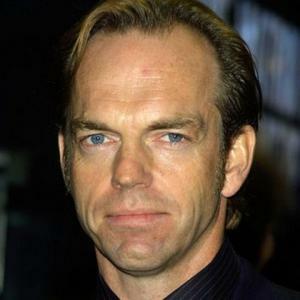 Furthermore, Michael forces Joey to make peace with Vincent Mancini (Michael’s nephew), who claims Zasa has been publicly insulting Michael and views Zasa as a legitimate threat to Michael. These perceived slights gnaw at Joey Zasa, and – after an unsuccessful attempt to eliminate Vincent – he plots Michael’s downfall. Aligning himself with Michael’s enemies, Zasa engineers an admittedly brilliant mass murder of various Dons of the Commission in Atlantic City, New Jersey; unfortunately for Zasa, Michael Corleone – his chief target – escapes. Fast forward in time: New York’s Little Italy is celebrating a religious festival dedicated to the Virgin Mary, and Zasa has put up a Cadillac as a raffle prize. A Corleone accomplice scratches the Cadillac, infuriating Zasa. His henchmen go after the vandal, only to be gunned down by disguised hitmen. Zasa himself flees on foot, but his escape is hindered by a locked door. He is shot three times in the back by Vincent Mancini, who had disguised himself as a mounted police officer. Now, Sad Puppies, do you see? Do you see the lesson you should learn? You are Joey Zasa. Considering yourselves slighted, you engineered the downfall of those who opposed you. It remains to be seen what – if any – ultimate victories you may secure. What is certain is the stunt is unlikely to be repeated. I’m not saying someone is going to gun you down; in fact, they shouldn’t. That would be murder most foul and an atrocity beyond the pale. What I am saying is that you won’t get away with it again. Enjoy your brief time in the sun, Sad Puppies; enjoy it while it lasts . . .
. . . and remember Joey Zasa. I have no dog in the Hugos fight. I also like Doctor Who, and I follow John Scalzi’s blog – for whom the Sad Puppies harbor a special venomous hatred – but I’ve never read any of his books and don’t rightly recall why I started following him. I like his blog, though; I’ll have to check out his books someday. Why do you hate him so, Sad Puppies? Why? I owe credit to one Scott Richardson, whose reply on Karey English’s post inspired me. I feel like Michael Corleone at this point (“Each time I get out, they pull me back in again!”). I ducked out of fandom a long time ago because of this kind of thing. I got pulled back because there were anomalies in the Hugo ballot and my brain gets attracted to those like a pig to truffles. A special thanks is due the Godfather wiki, whose biography of Joey Zasa was quite useful in my summation. Twitter – where you can see my thoughts – and humorous retweets – in 140 characters or less. I was going to write about my thoughts on Global Warming and environmentalists; however, I discovered the work has already been done for me. First, let me state I believe in climate change. I also believe that change could be part of Earth’s natural process and, therefore, that it is impossible to quantify man’s specific impact on any perceived climate change. This article explains my position in much better – and much more scientific – terms than I could. Today I’m off to the aquarium and maritime museum; look for photographs in the next Sunday Snapshots (a feature I just made up as I’m typing this – we’ll see how it goes). 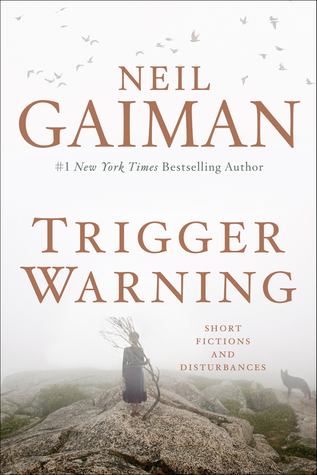 This week I’m reading Trigger Warning by Neil Gaiman. I haven’t technically started it yet, but it’s next on my TBR pile, so I’ll just open a page at random . . . I don’t know about you, but that’s tantalizing, right there! 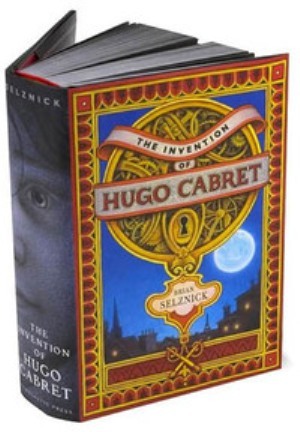 Makes me want to read it right now! Unfortunately, other items require my attention. Things like grading papers and preparing for end-of-term exams and sending out summer school remedial class notices (hopefully not). And today, a field trip! Huzzah! I haven’t yet finished The Disappearing Spoon by Sam Kean, but of the 49% I have read, it’s absolutely wonderful; I plan on condensing and incorporating some of his anecdotes in next years’ classes.